Last Thursday, we were delighted to welcome the Young Apprenticeship Ambassador’s Network to UKFast Campus to announce their arrival in the North West. Bryn has the lowdown on the conference. It was a most excellent day filled with inspirational speeches from the likes of former Olympian Diane Modahl, our very own Managing Director Jonathan and some of the Young Apprenticeship Ambassadors themselves (pictured). YAAN’s mission is to create an invaluable network of young people and businesses across the country that will promote the value of apprenticeships. Ultimately, they want to get more young people into education and training that keeps them debt-free, gives them actual workplace experience and teaches them the skills the UK’s industries are in desperate need of. At the conference, proceedings kicked off with an introduction from the Director of the National Apprenticeship Service, Sue Husband. It was an uplifting start, with Sue telling us how the perception of apprenticeships is changing. She said: “Apprenticeships can be seen as second rate compared to going to university”. But with apprenticeships now going up to degree level, that gap has been bridged in terms of the quality of the programmes and now perception is catching up. With the government’s target to reach 3 million apprentices by 2020 – that’s one new apprentice every minute for the next 5 years – organisations like YAAN are doing everything they can to spread the word and help young people understand that there is another option besides university. But it’s not just young people who YAAN are trying to reach. One of the young ambassadors who spoke at the conference was Anna Schlautmann, a fourth year logistics apprentice at MDBA. She made the point that it’s not just school leavers who perhaps have the wrong idea about apprenticeships; parents, teachers and also employers are perpetuating the idea that an apprenticeship is less valuable than a degree. And, we can certainly tell you, that is not the case. As our MD Jonathan, said in his speech, “apprentices have added more value to our business than graduates – they’re more loyal, they better represent our values and they’ve developed the right skills”. 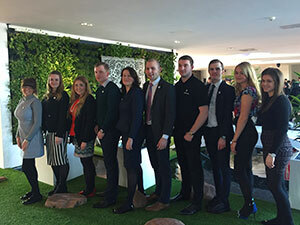 So far, 100% of our graduated apprentices have moved into full-time roles within the company. The system works! That’s why our partnership with YAAN is such a good fit. We’ve seen the profound benefit a successful apprenticeship programme has for a business, so teaming up with an organisation who wants to shout that out from rooftops is a no brainer. YAAN is on the hunt for more ambassadors to join the cause so, if your business runs an apprentice programme and you want to help spread the word, you can sign up as an ambassador. As Jonathan explained at the YAAN conference, encouraging young people to consider an apprenticeship is a key goal for UKFast. We recently took on a whole new crop of talented youngsters in the wake of the Bright Future closure and are always on the lookout for future superstars to join our team. If you would like more information on UKFast’s award-winning apprenticeship scheme take a look at our website.